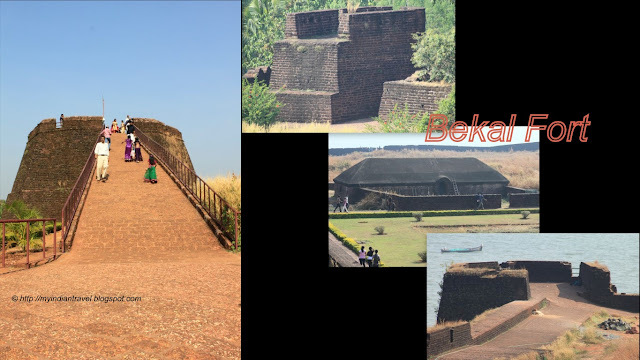 This 13th century Bekal Fort at Pallikkere is the largest and best-preserved fort in Kerala on the Arabian Sea. early period, the fort was under the control of Kadamba dynasty and later ruled by Kolathiri Rajahs. The fort is built of literate blocks directly over the bedrock. It is roughly polygonal on plan perched peon the steep bank of the sea. The twelve meter high fortification wall is impregnated with 15 bastions of semicircular, octagonal, oval, square and rectangular shape. The main entrance in zigzag fashion on the north side. The fort appears to have been built up from the sea as three fourths of its exterior is drenched and the waves continually stroke the citadel. Fort is open on all days, and it is maintained by ASI. What an awesome fort - it's in great shape. Intriguing fort design. That would be an interesting place to wander with splendid views of the sea. I came looking for your Monday Mellow Yellow post, but can't seem to find it. These views of Bekal Fort are so nice and interesting. Such a vast aria of fort, open places and interesting structure, as well! Have a pleasant week ahead! Great post and awesome photos of the fort. Happy Monday, enjoy your new week! You have such ancient culture there to enjoy! Quite interesting. What an interesting fort....built on the sea and fortified in many different ways. Lovely place to visit. nice photos too. That brick walkway looks as if is going to drop off the face of the earth! Very interesting history there ... How great that it is maintained and open to all. The fort looks like it is camouflaged by the surroundings. I imagine it took several boats by surprise. What a great find! Another fascinating place, Rajesh, and wonderful captures!! Thank you as always for sharing your photos with us!! I hope you are enjoying a great week!! It is really neat to see inside the fort. It is massive. So much walking in order to see everything. I really enjoyed seeing the inside as well as the outside. You have no idea what is behind those walls thanks for showing us. Nice shots of the fort. Forts are always interesting. I love to visit forts and imagine how in those time people lived there. Thanks for sharing the pictures. I am always amazed by the archicture you share with us. Looks like a great location for a fort! It looks sort of medieval English in style. It's a marvelous old fort! It must have been very fun to visit! It's in a good shape for a change. Nice clicks as usual! Great captures of the fort. What an amazing building - it was definitely built to impress! I love coming to your blog. You really make me want to travel and see these great sites in person.